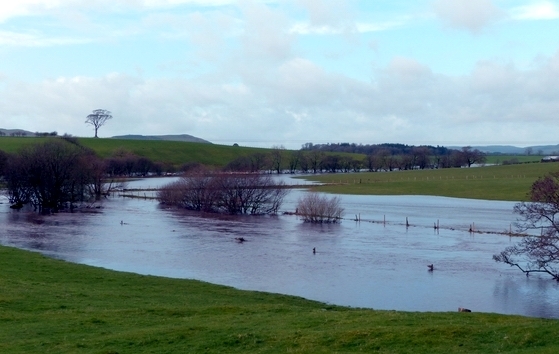 Been a bit wet here lately! This year I think the April showers came along with the March winds! At least, I hope they did, and that we're not going to get them again this month! The river by our house, usually calm and placid, turned into a lake. Fortunately our house is well above any possible flood level, but it is quite scary to see nonetheless. February was lovely, much warmer than usual, but March certainly made up for it, and though the daffodils came out a good few weeks early, no doubt spurred on by the warmth of February, they are probably wishing they hadn't, as they are now being battered by the winds, sleet, and hail showers, and shivering in single figure temperatures! And it's only a couple of months until the longest day! As usual, it is up to you how you interpret this, but the main image of your project must be stamped and relevant to the theme. Please check out our full challenge rules here to ensure your entry is eligible. Our lovely sponsors this month are Be Creative who are offering a fab £25 voucher for the lucky winner to spend in their online store. I had a gorgeous new background stamp from Concord & 9th which I was itching to use, and it happened to be perfect for our theme. It's called Lovely Blossoms and is a turnabout stamp. If you've never come across turnabout stamps before, there are many Youtube videos on the subject that are worth watching. 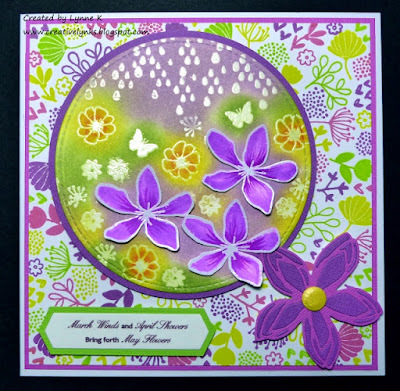 Having stamped and matted the background on to a 6"x 6" base card, I used the emboss resist technique to create the circle element. I stamped all the images with Versamark ink, embossed them with clear powder, and sponged various colours of pigment ink over the top. Wiping away the excess ink with a tissue made the stamping pop. I added a bit of extra colour to the main flowers with brush markers, and the result was nice enough, but didn't quite have the impact I was hoping for. After a few moments thought, I decided to stamp and colour the three large flowers again, cut them out and attach them over the original stamping with sticky pads. That simple addition made a huge difference and gave depth to the picture. It just needed something in the bottom corner to balance the composition. 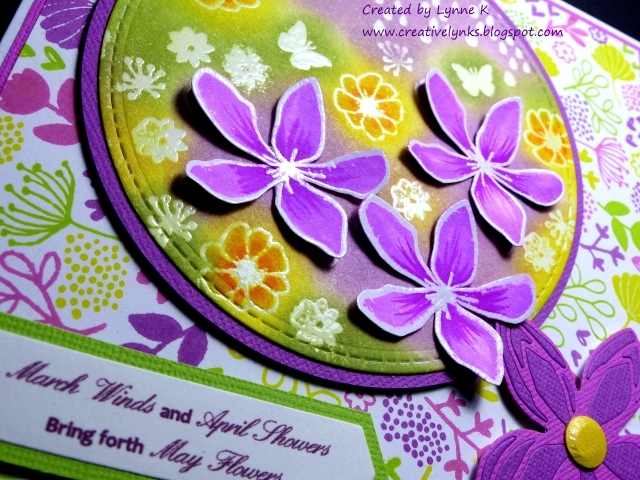 I had a Concord & 9th flower die which was similar to the stamped flowers, so I cut it twice and used the cutouts from one to fill in the other, with a piece of Card Candi from Craftwork Cards for the flower centre. All stamps by Concord & 9th, except for the raindrops, which was a magazine freebie. Circle dies from The Works. The sentiment is computer generated. 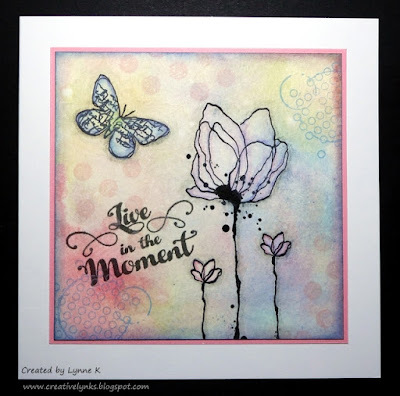 In case you're stuck for ideas, there's some gorgeous inspiration from my teamies over on the Stamping Sensations Challenge Blog. We are looking forward to seeing lots of lovely flowery showery entries! The other week it was the Pink Ink Meadow Hare that bounded through my letterbox. This week a Sea Turtle swam through! 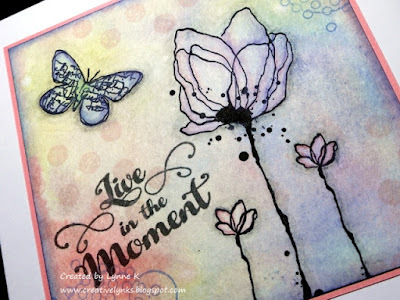 Another stunning Pink Ink Designs stamp. I wonder what will come through next. You'll have to watch this space! 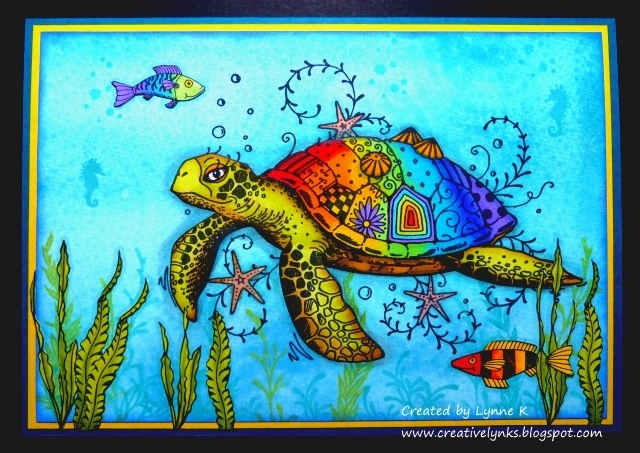 As our topic for this month's Stamping Sensations Challenge is "Somewhere Over The Rainbow", I decided to give my turtle a rainbow shell. So he's under the rainbow, rather than over it, but I think he'll still count! 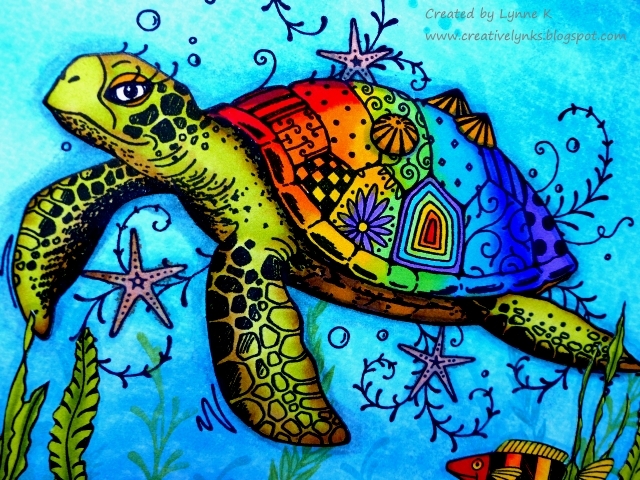 I made a background with Distress Oxide inks and overstamped the turtle. Then I stamped him again on a separate piece of card, along with the seaweed and fish, cut them all out and coloured them with a mixture of Arteza and Zig brush pens. I then stuck the turtle on top of the original stamped image, added the fish and seaweed and matted the resulting picture on to an A5 card. All stamps are by Pink Ink Designs. The Pink Ink Meadow Hare is still my favourite, but the turtle is coming a close second. He's fabulous to colour. There's still plenty of time to enter our Rainbow challenge. 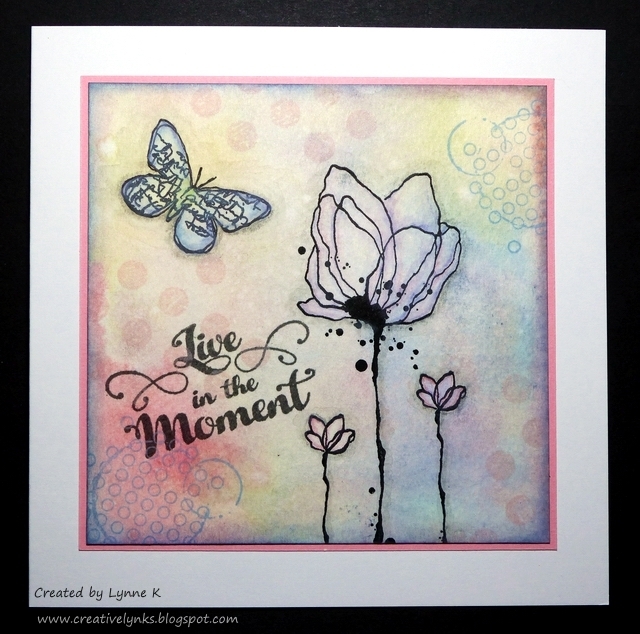 Full details are over on the Stamping Sensations Challenge blog. There have been some brilliant entries so far. Judging this month is going to be tough! The other day I came across something called Alcohol Lift-Ink by Tim Holtz. Yeah, I know, where have I been for the last six months, lol?! It hadn't come up on my radar until now, and it sounded interesting, so I thought I'd better find out what I'd been missing. I'm glad I did! It's clever stuff! For anyone else who's been hibernating like me, you can learn all about it in Tim's video here. Anyway, I've had a play with it and made a few cards. 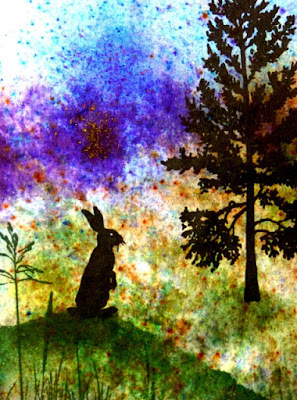 My alcohol inks had been neglected for quite a while, and the Lift-Ink gave me the impetus to get them out again. Wish I'd found it sooner! Just had a play with some lovely new stamps from Visible Image, Distress Oxide inks and watercolour pencils. A Riot of Colour For March! You can take inspiration from either the colours of the rainbow or from the well known song. All we ask is that your main image is stamped and that your project adheres to our Challenge Rules, otherwise it will not be eligible for our fab prize, and may not be commented on. Our lucky winner this month will receive a lovely selection of dies. I've gone for rainbow colours for my card, and kept the design quite simple to let the colours stand out. I've had this very pretty Woodware flower stamp in my stash for a while and never got round to inking it up until now, but I thought it would be perfect to show off our rainbow theme. The sentiment is part of the same stamp set. The card was very quick to make. 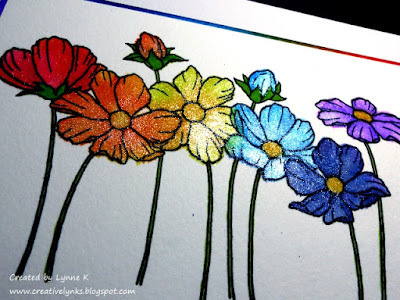 I used ink dusters and Distress Inks to make the rainbow background, and the same inks to colour the flowers. 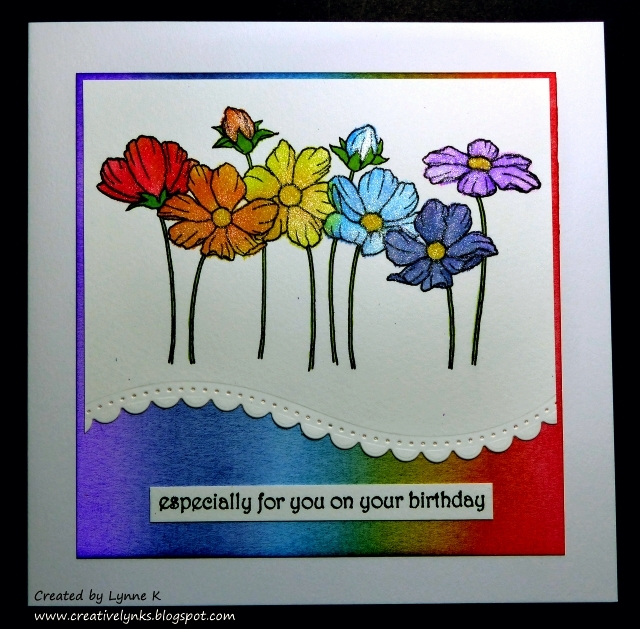 I cut the border with a Spellbinders die and added some sparkle to the flowers with a Spectrum Noir sparkle pen. You can see the effect better in the next photo. I know I say this often, but my brilliant teamies really have outdone themselves with their projects this month! Go and feast your eyes on the rainbow of stunning samples over on the Challenge Blog, and then see what you can come up with to rival them! We're looking forward to seeing a riot of colourful entries! I recently discovered Pink Ink Designs, who have the most amazing animal and fantasy stamps! 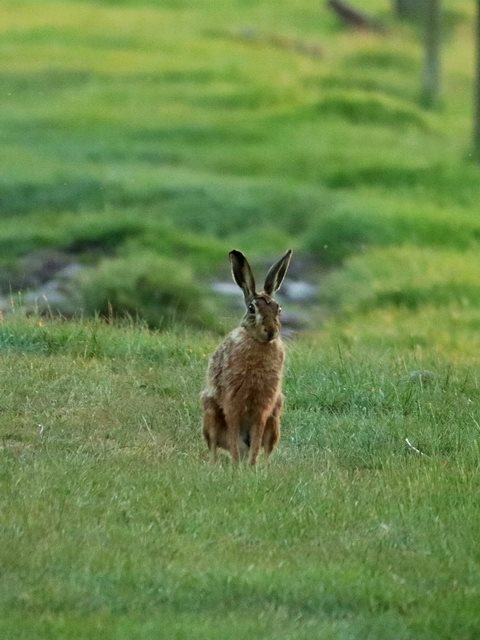 Would have loved to get them all, but the set I was most drawn to was the utterly gorgeous Meadow Hare. She bounded through my letter box this morning and I couldn't wait to ink her up. There are hares in the fields around here, and I love to see them. They are beautiful creatures. They often sit just like this, ears pricked up, alert for any sound or movement, and then they are gone in a flash. 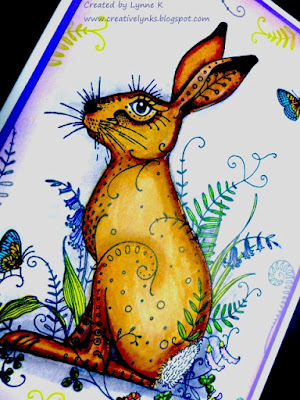 I coloured my Meadow Hare with Arteza brush pens (another new discovery, with which I am impressed!) and a water brush. It's a huge stamp (this is an A5 card) and I kept the design simple to show her off. She won't be my last Pink Ink purchase, as I have my eye on several others, but I think she'll always be my favourite! More things Bright And BEAUtiful! Here's another of my samples for this month's All Things Bright And BEAUtiful theme at Stamping Sensations Challenge. Again, all the stamps I've used are from our sponsor for February, the wonderful Bee Crafty. The tulips are from their gorgeous BEAUtanicals range, and the butterfly is from the Birds & Butterflies set. But Bee Crafty are not just about stamps, stunning though those are. They also have lots of accessories with which to enhance your projects, including some fab MDF pieces such as the Victorian Tag Artboard which you see here. There is still plenty of time for you to enter our challenge, and since the prize is a fantastic £25 voucher to spend in the Bee Crafty online shop, what's not to like?! 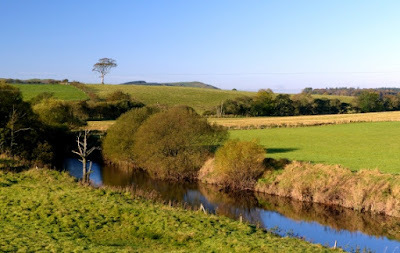 My teamies also have more stunning projects for you over on the Challenge Blog, please do take a look and they would be delighted if you paid their individual blogs a visit too. If you have already entered, or are inspired to do so, good luck! If not, I hope you enjoy looking anyway! We are thinking along the lines of the wonderful old hymn - All things bright and beautiful, all creatures great and small. We'd like to see your hand stamped creations celebrating the wonders of nature. Please do make sure that your entry fits our challenge rules which you can find here. We are delighted to welcome back Bee Crafty as our lovely sponsor for February. 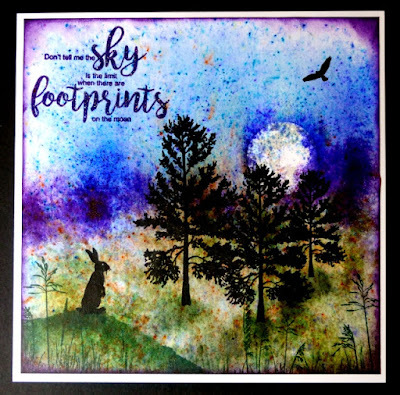 They have a wonderfully eclectic range of fabulous stamps and stencils, and loads of other things too, and our lucky winner will be able to choose £25 of lovely new stash from their online shop. 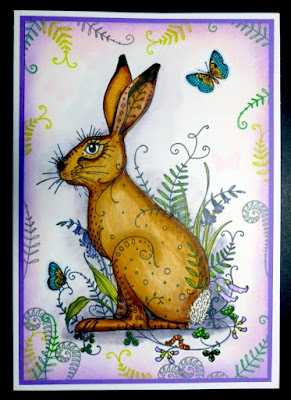 I decided to make something other than a card for a change, using stamps from two Bee Crafty sets, Scenery Animals - Fox and BEAUtanicals - Ferns. I made a plaque from wooden lolly sticks and painted it with gesso to prime it. I created the background with a home made mountain stencil, punched circle mask for the moon, and Versamagic pigment inks. All stamping was done with Versafine Clair ink. The row of trees and the single fern (which I hope looks like a tree!) 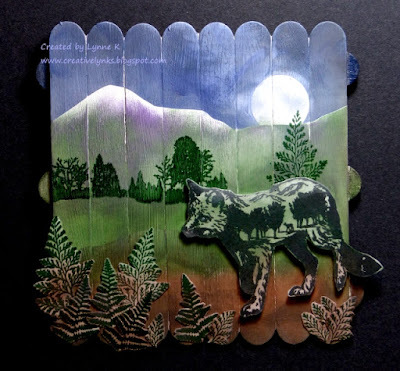 were stamped directly on to the plaque, while the foreground ferns and the fox were stamped separately and cut out before being affixed to the plaque. 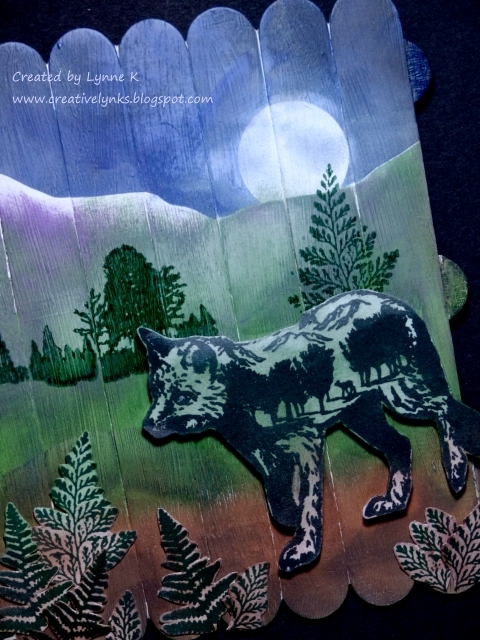 Here you can see the beautiful scenery detail in the fox stamp. I'm sure this will be a popular theme, and I can't wait to see what you come up with! My amazing teamies have once again excelled themselves with some gorgeous samples to inspire you, so do go and have a look at them on the Challenge Blog. Remember, you can enter up to three times, and with such a fab prize on offer, it's definitely worth maximising your chances of winning. Good luck everyone! Hadn't used the Brushos for ages, so having a few spare minutes, and some lovely new stamps from Stamps By Me, I thought I'd get them out and have a play. First I stamped and masked the moon, and then made the background with the Brushos using the sprinkle & then spray method, blotting it after spraying to lighten it up as it was quite dark. Some of the paint leaked under the mask a bit, but I quite liked the effect. I thought it looked like clouds over the moon and gave it some dimension. Serendipity! 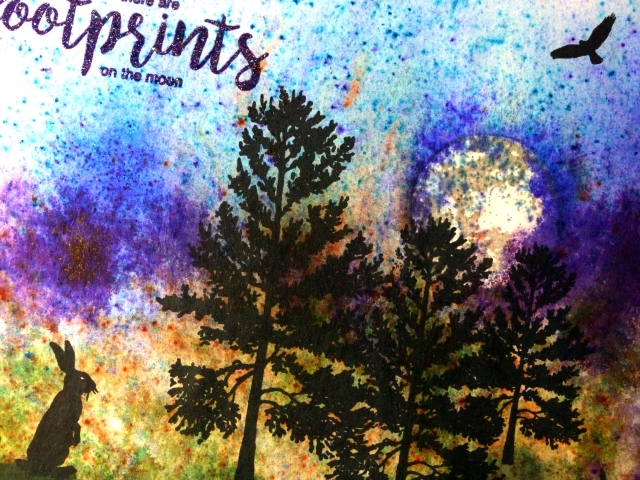 The Stamps By Me set has the trees, the moon and two sentiments. I particularly liked the one I've used here, but I thought the picture needed something else to help tell the story, so I added the rabbit & buzzard, along with a few grasses at the bottom, all from Inkylicious. I stamped the sentiment in Versafine Clair ink and embossed it with WOW Neutral Ultra Shimmer Regular powder, which has the most gorgeous sparkle, but the photo doesn't do it justice. You can perhaps see it a little better in the next one. It's quite a while, well before Christmas in fact, since I had chance to make something just for the sake of it, rather than for a particular person, event or occasion, and I really enjoyed doing this one. When I make cards for family and friends, I tailor them to the recipient and usually know what I'm going to do before I begin. Not that I don't enjoy doing those too, of course, but I love having the creative freedom to pick out a few stamps and inks etc. and just see where they lead. When I started making this card I had no idea how it was going to turn out, but I'm happy with the result! We'd like to see your creations in honour of the female of the species.You can choose to interpret this with your image, or colours, or anything that would appeal to the ladies, as long as your main image is stamped and your project fits the theme. We are so sad when we have to discount entries that don't follow our rules, so we are making a point this month of directing you to the paragraph below. It will appear each month but we would like to make you aware of its significance and your responsibility to familiarise yourself with our simple challenge rules. Please ensure you check our challenge rules here before entering, it may save you embarrassment and make sure your entry receives comments from the team and is entered into the prize draw: We run our challenge for fun in our spare time. It is your responsibility if entering to make sure you check our challenge rules, it is not our responsibility to read your posts and remind you if you fail to comply. If you do not follow the rules we will simply ignore your entry. Anyway, that said, here's my Fabulously Feminine card. All stamps are by Crafty Individuals, background paper by First Edition. The images were coloured with Promarkers. Here's a closer look at some of the details. Our fab prize this month is a super selection of stamps. 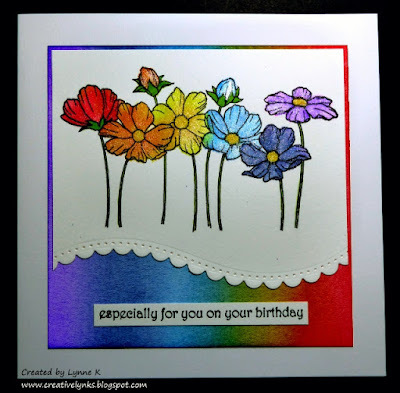 Check them out on the Challenge Blog, where you will also find some gorgeous samples from my lovely teamies. We look forward to seeing your Fabulously Feminine creations! And thanks for taking the time to visit. I hope you find something here to enjoy, maybe be inspired by and (occasionally) even be amused by! I've been crafting in one way or another for about as long as I can remember, and cardmaking for well over 25 years. I'm privileged to live in rural SW Scotland, where, as a nature lover, I have only to look out of the window for fresh inspiration. I love getting comments, and each one is read and much appreciated. Hope to see you again soon! I hold the copyright for all designs and photographs on this blog, unless otherwise stated. I am happy for you to take inspiration from them, but please do not copy them to publish elsewhere. Retired primary school music specialist, addicted to rubber stamping & papercrafts, also into photography & playing my bowed psaltery. Visit Lynne's profile on Pinterest. I won Challenge No. 1! Challenge blog for Clean & Simple cards.